‡Ref. : Schrader, F.C. (1909), Mineral deposits of the Cerbat Range, Black Mountains, and the Grand Wash Cliffs, Mohave County, Arizona: USGS Bull. 397: 165. Bancroft, Howland (1915) Geology of Gold Road district (near Kingman, Arizona): Mining and Scientific Press: 111: 21. Ransome, F.L. (1923), Geology of the Oatman Gold District, Arizona, USGS Bull. 743: Plate 1, 36, 45-47. Lausen, C. (1931), Geology and ore deposits of the Oatman and Katherine Districts, Arizona Bureau of Mines Bull. 131. A.I.M.E. Ore Deposits of the Western States (1933): 166. Wilson, E.D., et al (1934), Arizona Bureau of Mines Bull. 137: 80, 93-94. Gardner, E.D. (1936), Gold mining and milling in the Black Mountains, western Mohave County, Arizona, U.S. Bureau of Mines Information Circular 6901: 31-32. Galbraith, F.W. & Brennan (1959), Minerals of Arizona: 85. USGS 7.5 minute Oatman topo. map. Arizona Department of Mineral Resources (ADMR) Householder map. U.S. Bureau of Land Management District map. Arizona Department of Mineral Resources (ADMR) Mohave Custom Mill project card file. MRDS database Dep. ID file #10027907, MRDS ID #M004450; and, Dep.ID #10283616, MAS ID #0040150160. A former underground Au-Ag-Be (trace) mine located in the S½ sec. 11, T.19N., R.20W., on 4 claims (Gold Road, Lineroad, Billy Bryan, and the Railroad),northeastern part of the district, about 1½ miles (2.2 km) NE of the Tom Reed vein and about 1¼ miles NNE of Oatman. Discovered by Joe Jeneres. Started in 1902 and closed in 1916. Reopened in 1922-1923 and overall from 1903 through 1949. Previous Owners and operators include the Gold Road Mining & Explorations Co. (1902); Needles Smelting and Refining Co. (1911); US Smelting, Refining,m and Mining Co.; Goldfield Great Bend Mining Co.; Jack Shank; J.D. Spargo; E. Templin; F. Shasson; and, D.B. Harper. 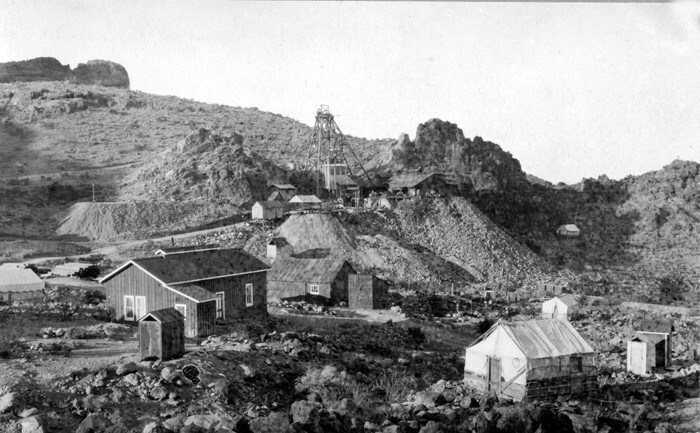 Rich ore was struck in 1900. The Gold Road vein strikes about N.50ºW., and dips 80º to 85º NE and occupies a fault zone in latite. A NNW to WNW-trending vein and fault system is in Tertiary volcanic rocks. Sheeting of andesite strikes N.40W. and dips 90º. Latite occurs to the north of the vein, while to the south both latite and andesite can be found. The ore zone overall is 2,011.63 meters long and 30.48 meters wide, with a depth to bottom of 213.36 meters. The vein is a stringer lode with a prominent outcrop, in places nearly 100 feet wide. Most vein filling occurs in 2 zones, termed the North and South veins, separated by largely barren latite with minor stringers of quartz. There are 3 orebodies: #1 shaft area, Sharp orebody, and the Rice orebody. The district also has small amounts of chalcopyrite, chalcocite, pyrite, chrysocolla, red Pb oxides, and wulfenite. The ore is enriched by oblique stringers that join at acute angles from the NW, on the hanging wall side of the vein. Ore is found in rhyolite dikes as finely disseminated gold. 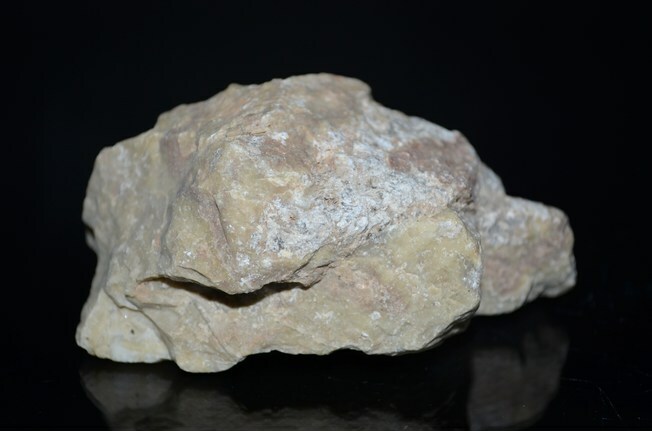 The ore is associated with present water flow courses, and occurs on the hanging wall of the vein. Most ore mined has come from 3 shoots on the north strand of the vein. The largest shoot being 900 feet long, 22 feet wide, down to the 700 foot level. Most of the ore was from 2 to 10 feet wide. Workings included 4 shafts, including the #1 shaft and the Line Road tunnel with an ultimate length of 5,608.32 meters and a depth of 274.32 meters. This latter working prospected the vein below the ourcrops for some 3,000 feet (1,000 meters) horizontally but found no additional commercial grade ore. The principal area of stoping is around No. 1 and No. 3 shafts, on the Gold Road and Line Road claims. Output was $6,654,050 in gold to the end of 1923 (period values).